Where Blacketts once stood on Stockton High Street. Photograph and details courtesy of John Simpson. Our mam Barbara worked in the pram shop, shown on the opposite corner to Blacketts at about the time of the photograph. I worked as a Saturday girl in the millinery department 1965/6 and loved it. Also helped out in skirts and woollens and still fold my woollies properly. Have lived away from Stockton for decades now and was horrified to see the awful so called modernisation of the High Street when I went for a visit a couple of years ago. Sorry you feel that way Lynne, but things have improved more recently. I think there will be many towns across the uk that would be glad to have this view at their town center. Times have moved on, retail is dead, so the High St. has to find new reasons to still exist. If you visit during the annual Riverside festival or other events you would see the High street in a different light, as a stage where these events can be held. It’s an up-hill struggle, we locals need to use it or we will lose it. Many moons ago (OK the mid 1950s) I got myself lost in Blacketts and made my way into the High Street. Someone found me and took me to the police station where a very kind sergeant gave me some Maltesers. I was 3 or 4 at the time. A couple of weeks later I did the same thing again only this time on purpose in search of more sweets. Mum wasn’t impressed from all accounts! My dad used to work for Blacketts and from what I can remember the demolition site was what used to be the dispatch department of the shop. All the items bought in the shop which the customers wanted delivered by van, were collected here for delivery. Blacketts also had another entrance the other side of The Stag inn a little further down Silver Street. I worked in the office of Blacketts when I left school in 1960. I remember Miss McNicholas as my boss and all the typists who were spinsters great memories. The picture appears to contradict the headline as Blackets is next to the demolition site. Comparison with the pic taken in 1957 shows that only half the building has been demolished. 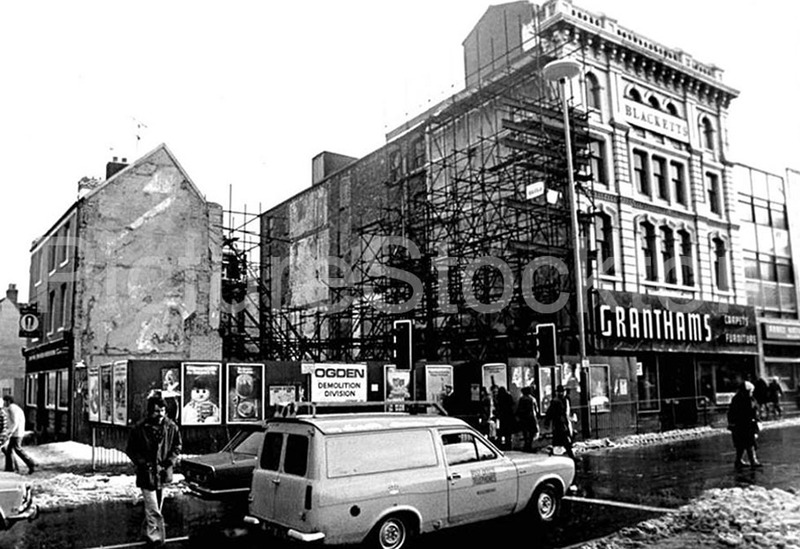 There was another shop next door (the demolition site) which was also Blacketts. Blacketts had closed by the time this photo was taken, Granthams had taken over the premises. Scaffolding was up for years before the site was redeveloped. Do we know an approximate date? My Dad used to work at Abbey National (on right) and there is right of way to the rear of the property down the side street. 1977 – Site had been demolished. 1983 – Had been built on. The demolished building looks to of pre-dated the larger building to the right, (this photo is from a 1916 Almanac, the photo could be older).